It’s no secret that students are most engaged in learning when exposed to interactive spaces, tools and teaching. 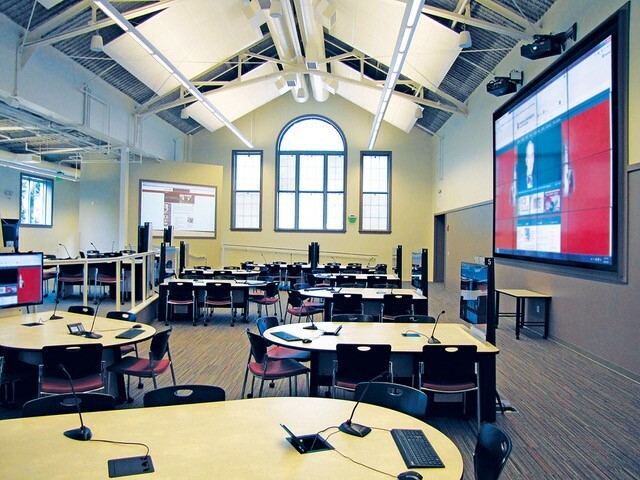 In an effort to modernize traditional collegiate instruction, Indiana University (IU) is on a mission to transform their outdated and unused areas into active learning environments for students. In response to this initiative, several officials partnered with the University Information Technology Services (UITS) and Learning Spaces Design Team to brainstorm ways to reinvent a dormant space on campus. The room was a blank slate. Previously used as a map library for the school’s geography department—the large, open room had fallen latent as maps were digitized and no longer used by the department. Leadership at IU wanted to see the sizeable, architecturally dynamic space put to good use, ultimately deciding to convert the unused area into a Collaborative Learning Studio. From a room used to house physical maps, to an active learning classroom that maps the way for future learning spaces—the Collaborative Learning Studio set the stage for a reimagined lecture hall. When developing the layout and features, officials looked at what other schools had for active learning as inspiration for the space. An integral feature of the studio’s active learning setup is the Spectrum Collaboration furniture. IU used multifaceted tables that are vital for active learning because of their technology integration, mobility and capacity for several students. The collaboration tables are considered “mini-classrooms” by many instructors because of the independence it gives students to share ideas and tinker, while also allowing them to work collaboratively. Because the concept of the room began as a blank slate, the university designed a flexible environment that caters to students’ preferred methods of learning. “One of my students recently said that the seating in this room helped her find her ‘math tribe.’ They get together out of class and work together. Many students expressed how much they enjoyed the classroom and that it was a much better learning experience,” said Shabnam Kavousian, mathematics lecturer at IU. When the Collaborative Learning Studio launched, there was some reluctance from professors due to the application process of reserving the room. The school used this as a way to vet out instructors who just wanted to use it as a basic lecture hall. However, demand for the Collaborative Learning Space grew as more faculty discovered the versatile uses and heightened student engagement in the room provided. Applications for use of the room are prioritized by courses that provide clear plans for utilizing the space and its technology in support of active learning. Several other criteria must be met before instructors are granted use of the studio, including: instructor attendance of a course development workshop, agreement to participate in research about the effectiveness of these spaces for enhancing active learning and student success, class size must meet at least 75 percent of room capacity, and more. The room contains 16 six-student tables (total seating for 96 students). Each table contains a computer, large monitor, connections for three laptops, and two push-to-talk microphones. Additionally, document cameras, speakers and portable white boards are available for use at the tables. A 20-foot diagonal video wall allows instructors to display multiple types of content, and includes standard instructor tools (computer, document camera, DVD player) as well as the screens of individual student tables. Made up of sixteen monitors, the wall can accommodate a “gallery view” of all sixteen student table computers. In addition to the video wall, content can be projected on two large screens at the sides of the room, as well as to the monitors at each table. The Collaborative Learning Studio is currently utilized for a variety of courses, including math, public health, anthropology, geography and most recently, engineering. There are usually 15 to 18 different courses held in the studio per semester, allowing students across campus to explore the possibilities in active learning. Starting with the individual learner, and then expanding out to the entire class, each set of students at tables can see how other groups solved the same problem for large group collaboration. A facet of active learning involves understanding how the instructor and peers think and problem solve. The advanced projection options from each table allow for sharing and discussion of student work, as well as for display of multiple pieces of content needed for table-based activities. Hacker noted that the tables allow students to easily connect with devices from around the room as well as connect their own devices to the table, amplifying the collaborative aspect of the space. Even though the maps are long gone, IU students are far from lost. The Spectrum Collaboration furniture helped discover pathways for active learning and collaboration.